I love all the fab arm candy all over the stores lately. I purchased this fab designer-inspired watch from NY&Co. 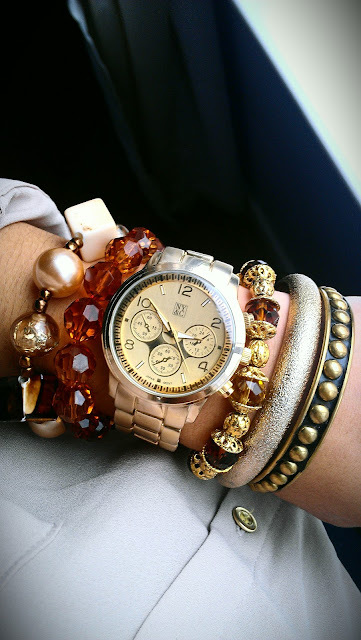 and paired it with some fun gold and brown bracelets! All from different stores, all I've had for years now. Don't be afraid to mix + match... have fun with your arm candy! Que les parece este fabuloso reloj que compre en NY&Co, es inspirado por los relojes de disenador, como el de Michael Kors. Quize combinarlo con muchos braceletes dorados y cafeces, que he tenido hace mucho tiempo. No tengan miedo de combinar diferentes estilos y colores! Great arm candy! I need to step up my arm candy game....lol!